Portal Second Age is the second starter level set of Magic and was released in June 1998. It consists of 165 cards and exists in English, French, German, Italian, Japanese, Portuguese (Starter Two Player only), and Spanish. 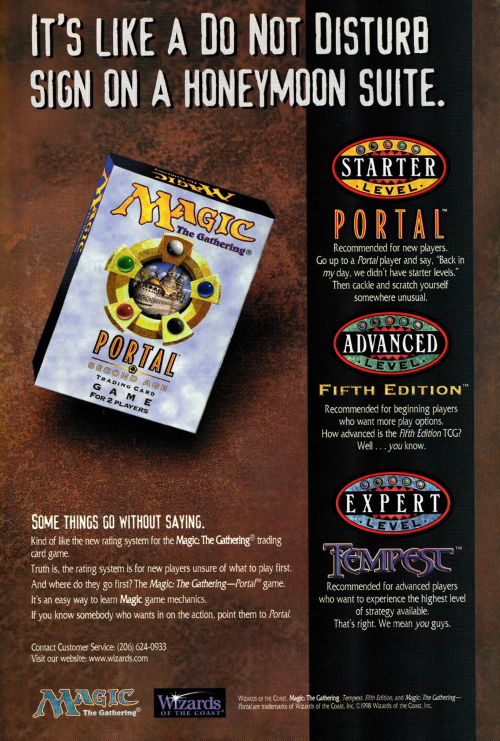 Like its predecessor Portal, the Portal Second Age set was made to introduce new players to Magic: The Gathering. The cards were kept simple and many concepts of Magic were left out completely. Due to the low power level of the set and the inability to use the cards in tournaments, Portal Second Age never became popular. Portal Second Age Demogame boosters were given away as a free product to advertise Magic: The Gathering. Aside from the tip card, they contain 24 standard Portal Second Age cards and a tip card. Despite their rebate label, no rebate cards were inserted. For unknown reasons, there are two versions of the German Portal Second Age Demogame booster in existance, one featuring a copyright date of 1998 (WOC21064) and the other one featuring a copyright date of 2000 (WOC21066) on the back of the booster. Only the 1998 version contains a Portal Second Age tip card, the other one has a Black Border/Black Border filler card in its place. It is not known for the moment if the English with Norwegian/Danish Rules (Regler pä norsk Danske regler vedlagt) WOC31004 and English with Norwegian/Danish/Finnish/Swedish Rules (Regler på norsk Danke regler vedlagt Suomenkieliset säännöt regler på swenska) NO WOC include an English tip card. Portal Second Age Demo boosters Portuguese(WOC23080) and Spanish (WOC24079) contain a Black Border/Black Border filler card instead of a tip card. Portal Second Age Demogame boosters were also offered in the Guru program.